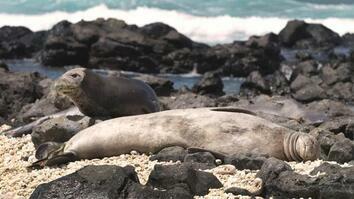 August 16, 2013—The rising number of Hawaiian monk seals on the main Hawaiian Islands is a boon for conservationists. But some local businesses and fishermen who are unaccustomed to living with monk seals view them as a nuisance and a threat to their livelihoods. Following a spate of seal killings, scientists use seal-mounted video cameras to dispel myths about how these endangered creatures really behave in the wild. "You have this animal come in maybe changing people's lives forever, and not great information. So, it's kinda like throwing a match into that powder keg. In the last decade we've had seals that have returned after thousands of years away to the main Hawaiian Islands and so may twenty years ago there were maybe 15 animals, 20 animals, and now there's 200 animals and still growing. The complication with that is that they're now flipper to foot with all the humans that are down there." "We've had a pregnant adult female who was shot, we've had seals killed with rocks to the head, and clubbings and the like. And there's no doubt killings that are happening that we're not aware of. Those started happening relatively recently while these tensions were really starting to escalate." "You know, there are people that are trying to make a living people, people trying to bring food home to their families, and so there are some understandable concerns about what impacts monkseals may have on that. People worrying about being able to develop industry because now there are seals around and so all commercial tourism and businesses are going to be shut down." "This is making the fishermen mad. They go through all of our fish in this area. I guess if they take the fish, we might as well kill'em and eat'em. Know what I mean? 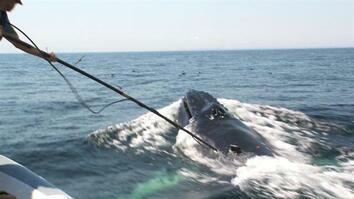 They're going to be taking your fish all the time every time you set your net. And if you set that net and you catch one of them, you get in trouble." 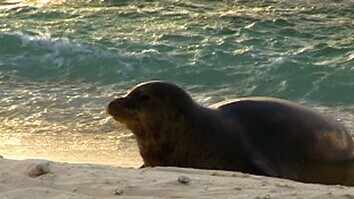 "Instead of saying, 'Oh, there's a monk seal. Let's go look at that monk seal' you know, the story now is 'wow, you know that monk seal, he came and took my fish from my net. And he's chasing away all the fish. What's going on with this monk seal?' So it's more of a slightly negative relationship." "Most of those people are just grabbing on to any source of information, and that's they best that they have right now. We've heard that on the more extreme end that monk seals are eating 600 pounds of fish a day. The largest monk seal that you're ever going to see is 600 lbs so there are few animals eat their weight in fish in a day so that's a physical impossibility. But sitting across the table and telling someone that- why should they believe me, I'm the government." "We knew if we could show the truth through the seal's perspective, using National Geographic Crittercams, that we could change people's minds." "The Crittercam is a tiny waterproof camera that you put on the back of a seal that allows you to capture the hidden behavior of the animals. Even though we've only collected 50 hours of footage, it's blowing a lot of these misconceptions out of the water. We're seeing lots of fish being passed up. I man, thousands of fish being passed up." "The estimate that one monk seal eats 600 lbs. of fish a day, based on what we know about monk seals, that would require them to eat one pound fish every 45 seconds and you will see 15, 20, 40 minutes go by before a monk seal eats anything." "It's easy for the naysayer to stand up and say 'You're lying, you're only showing us the stuff that's favorable for seals' So this guy said, 'You want to be transparent, give the data to our students, give the data to our children and let them see it and let them study it and that way when you're at a public meeting and someone stands up and says 'you're lying to us," these kids, on of their own community can stand up and say "No, we watched this all and what they're showing you is the most informative or the best stuff that is out there.'" "Some of them have become so fiercely passionate about this topic, some of them are almost livid about the fact there's these misunderstandings out there and they've gone out there and tried to get people to understand and they've talked to their families, they've gone out and interviewed the public to find out about misconceptions are out there. And it's really galvanizing, at least in the groups that we worked with, this desire to protect and share this information." "Already with these discoveries, its reining everyone in toward the center a little bit and hopeful it will shift some of the more extreme perspectives." "I'm thinking this thing is going to work. We've got some good scientist working on this thing. And they are determined to figure out how to work with the communities. It's a good thing and it's the right thing." "Our intent is not to make people love seals. What we're trying to do is get the truth out there. We are the people who are now here to try to go out and inspire people, to try to change people's minds, to have access to phenomenal technologies, to solve mysteries that ultimately can mean life or death for a species. It's nice to wake up in the morning and feel that what you are doing is going to be meaningful."